Persistent! That’s what the research team is. 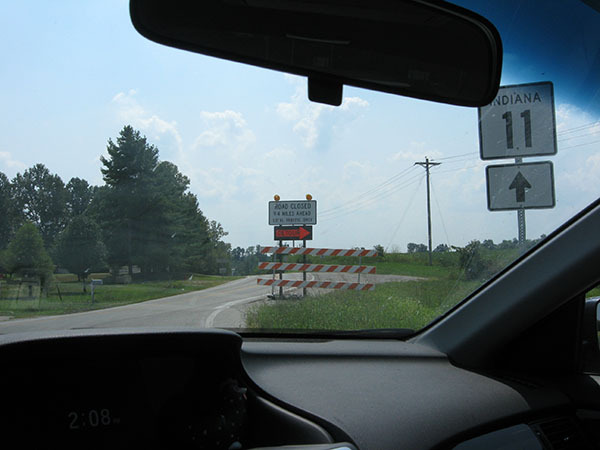 Driving along the Ohio River from New Albany to Mauckport on SR 111 and SR 11, we saw a sign at SR 11’s intersection with SR 337 “Road closed 9.4 miles ahead.” That’s a long way for a detour. It was late in the afternoon, and it was hot and humid, and we were hungry and tired, so we thought we’d forgo Laconia for the day and come back tomorrow. Tomorrow came and we started out on SR 11 from the other direction, from Mauckport. 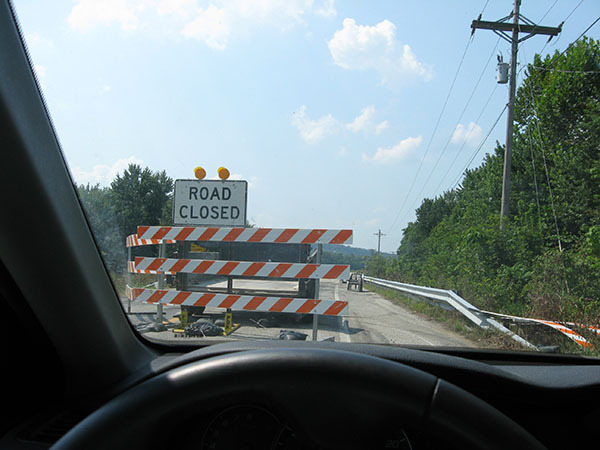 Google Maps says “Mauckport to Laconia: 7.2 miles, 12 minutes.” Just east of the Ohio River bridge, about 100 yards along our journey, we came upon the “Road closed” sign and the crew repaving the bridge over Buck Creek. We figure we don’t have to use the main roads and go all the way north to Corydon, and then back south — we can just use the little side roads. But that Buck Creek — it’s a real killer in the landscape! We find out, after seeking innumerable “Dead End: No Outlet” signs that nothing crosses it. Twenty-five miles, and about an hour later, having indeed passed through Laconia, we are back here: on the other side of the bridge. Yes, the research team IS committed to investigating every mile along the Ohio River.